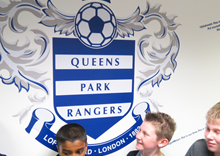 A group of 28 children visited Queen’s Park Rangers Football ground. They met with the Chaplain, Cameron Collington, who took the children on a stadium tour. In the stands the children blew bubbles across the pitch praying for God’s joy, hope and glory in the world of sport. In the same style as Shearer & Savage’s Sport Relief challenge, the children sat on as many seats as they could asking Father God to show his love and glory to the people that sit on those seats. In the dug out, they prayed for the managers, backroom staff, chaplains and teams supporting sportsmen and women in the nation. The children then set off down the tunnel to the changing rooms. The QPR Changing rooms have mirrors and name tags for each player. In the room, with Spirit Break Out in the background, the children listened to Father’s voice for each player and put a prophetic card above their name; some players had a handful of cards. They also wrote declarations on football shirts hanging on the pegs, similar to the Brazil 2004 team’s celebration. To finish the children spoke messages over the chaplain, office staff and stadium – asking for opportunities and breakthroughs on match days and at the training grounds. It was very powerful. The culture of sport is powerful in many people’s lives; many of our young people’s role models are sports men and women. Their roles and lives are under media attention. Come Lord Jesus and bring love, joy, peace, patience, kindness, goodness, gentleness, faithfulness and self-control. See the Mission in a Minute!